Over twenty-five years in the making, this much-anticipated commentary promises to be the standard study of Proverbs for years to come. Written by eminent Old Testament scholar Bruce Waltke, this two-volume commentary is unquestionably the most comprehensive work on Proverbs available. Grounded in the new literary criticism that has so strengthened biblical interpretation of late, Waltke's commentary on Proverbs demonstrates the profound, ongoing relevance of this Old Testament book for Christian faith and life. A thorough introduction addresses such issues as text and versions, structure, authorship, and theology. The detailed commentary itself explains and elucidates Proverbs as -theological literature.- Waltke's highly readable style -- evident even in his original translation of the Hebrew text -- makes his scholarly work accessible to teachers, pastors, Bible students, and general readers alike. "Proverbs is the fountainhead of the wisdom movement, providing 'old things and new, ' " explains Dr. Roland E. Murphy. Yet in the field of wisdom studies Proverbs has suffered a certain neglect. Even Dr. Murphy admits that during his career as a scholar he did "almost anything else with wisdom literature except write a commentary on this book." Drawing upon a distinguished academic career, Dr. Murphy now shares his vast insight into Wisdom Literature in this fresh translation and in-depth discussion. Dr. Murphy approaches Proverbs as "a collection of collections, ... prefaced by an introduction (chaps. 1-9)." The long poems of chapters 1-9 serve to introduce the collections of short sayings in chapters 10-31, which make up most of the book of Proverbs. With this division the writer accepts "the unproven but likely assumption" that during the postexilic period chapters 1-9 "set the tone" for the mostly preexilic collections in chapters I 0-31. Murphy cautions his readers to consider the limitations of proverbial sayings. The Israelite sages sought in their optimistic teachings to express "the mystery that surrounds all human action: not only self-knowledge, but knowledge of the mysterious role of God." Much of the wisdom of Proverbs points out the ambiguities of life. Yet the proverbs do not provide the final word; "rather they act as a goad, a prod to further thought." This treatment of Proverbs will be invaluable to clergy and lay readers who desire a penetrating study of the book. The writer leads us through all the types of proverbs: instructions, exhortations of a parent/teacher, speeches of personified Wisdom, and short sayings. "Israelite wisdom is more practical than theoretical. It attempts to persuade, cajole, threaten, of command a particular attitude or course of action . . . . When the sage says 'listen, ' 'hear, ' the meaning is 'obey.' " Roland Murphy, in this new commentary, helps us uncover this practical message of Proverbs. This is a completely revised edition of Gold Medallion Award-winning Expositor's Bible Commentary. 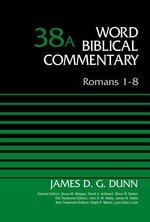 This revised commentary has undergone substantial revisions that keep pace with current evangelical scholarship and resources. Just as its previous edition, it offers a major contribution to the study and understanding of the Scriptures. Providing pastors and Bible students with a comprehensive and scholarly tool for the exposition of the Scriptures and the teaching and proclamation of the gospel, this ten-volume reference work has become a staple of seminary and college libraries and pastors' studies worldwide. 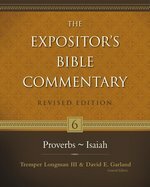 Its fifty-six contributors--thirty of them are new--represent the best in evangelical scholarship committed to the divine inspiration, complete trustworthiness, and full authority of the Bible.As before, The Expositor's Bible Commentary features full NIV text, but also refers freely to other translations and to the original languages. In addition to its exposition, each book of the Bible has an introduction, outline, and an updated bibliography. Notes on textual questions and special problems are correlated with the expository units; transliteration and translation of Semitic and Greek words make the more technical notes accessible to readers unacquainted with the biblical languages. In matters where marked differences of opinion exist, commentators, while stating their own convictions, deal fairly and irenically with opposing views. 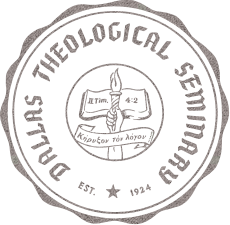 General Bibliography--occurring at the end of each volume, this extensive bibliography contains all sources used anywhere in the commentary. 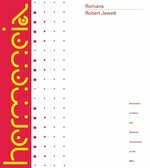 Deeply conversant in the full range of questions and interpretations of the letter, Jewett's commentary explores the crucial and controverted passages that have always animated studies of Romans. The Baker Exegetical Commentary on the New Testament offers up-to-date, accurate, and authoritative analysis of the Greek New Testament. Its features are designed to help pastors, scholars, and students. 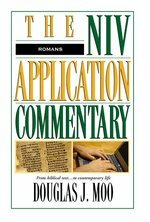 This book, part of the NIV Application Commentary Series, helps readers learn how the message of Romans can have the same powerful impact today that it did when it was first written.